This is my first time attempting a Binaural Blog format. The idea is that you can press play on a sound recording, then read some backstory as you listen. I hope my writings will give you a sense of context for what you are hearing and help you to better appreciate the recordings. As the sound is recorded binaurally it is advised to listen through headphones or earphones for a sense of immersion. Un grand merci à William Wartel who provided most of the photographs. 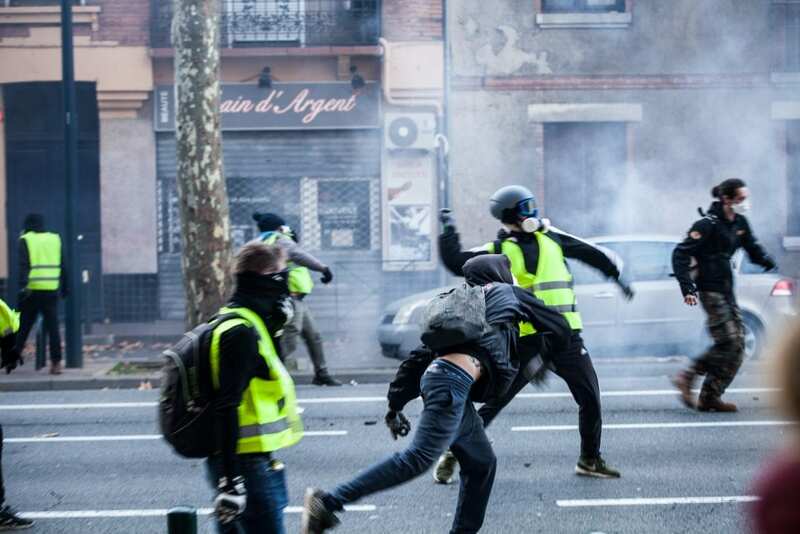 Now in its 10th week of protest, the grass-roots Gilets Jaunes protest movement has grown to historic proportions. The goals of the campaign remain diffuse, but discontentment with domestic politics continues to be defiantly expressed each Saturday. 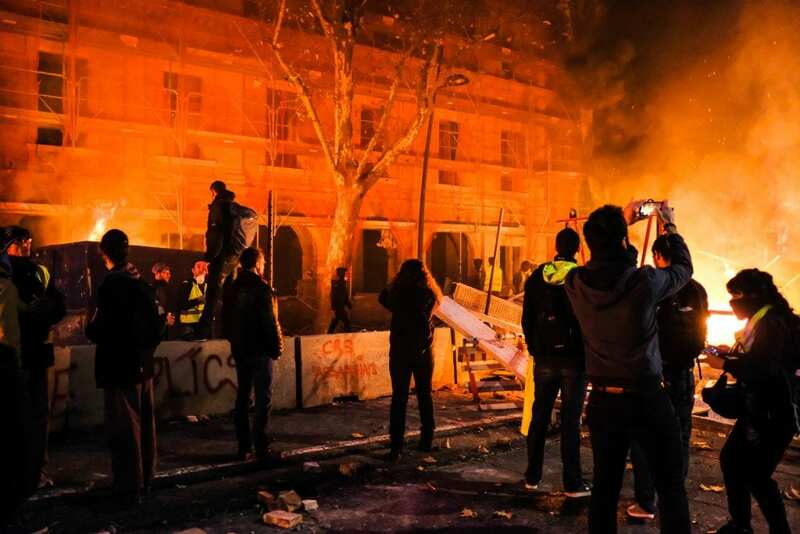 International Media has largely lost interest, as the number of Parisian protesters dwindles. 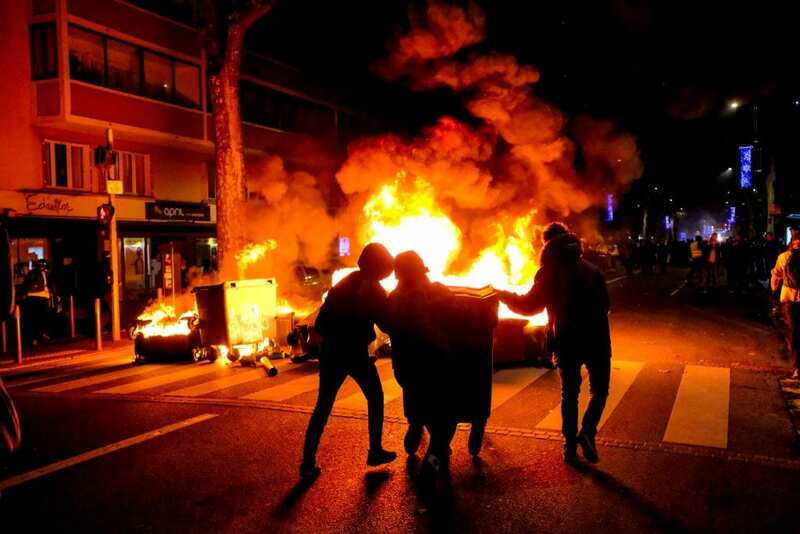 However in provincial France many feel marginalised by the government and the protests are as strong as ever. In some places it is still growing. Yesterday, my adopted city of Toulouse held the largest protest in the country, with 10,000 people taking to the streets. All this is despite several small government concessions having been made before Christmas. This is a movement that refuses to be bought-out or silenced. The Gilets Jaunes aren’t without controversy however. 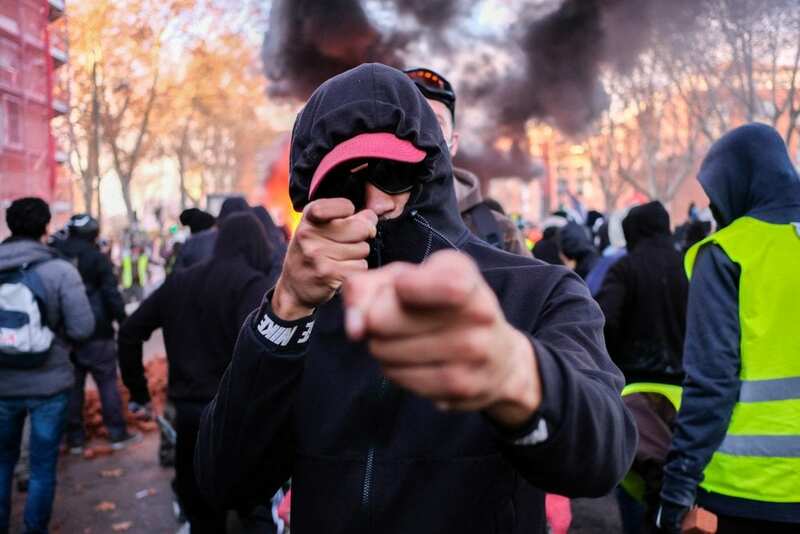 Often spearheading each protest are a squad of Casseurs (rioters). Some of them believe that the only way to be heard is to make a mess. But I also think that there are many others who just enjoy the sense of power that comes from rioting and vandalism. Clearly there are underlying reasons as to why they feel the need to express themselves this way. On the 8th of December, I set out to binaurally record a protest in Toulouse. 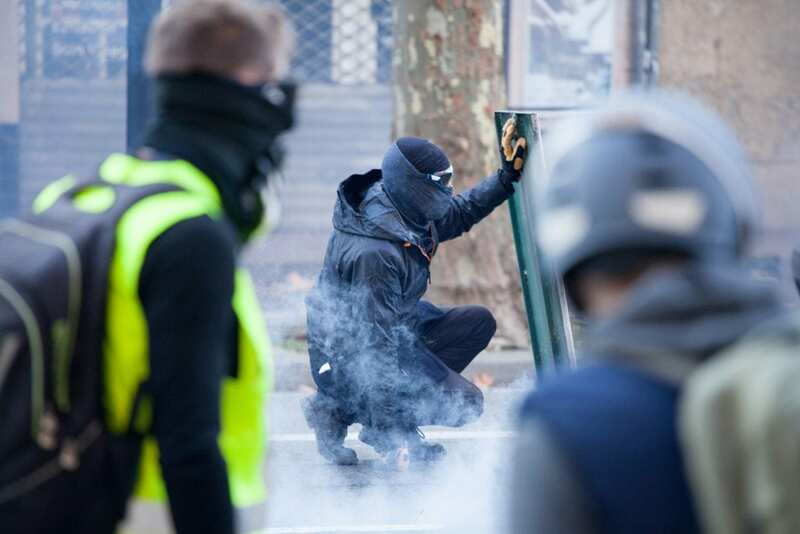 It was the 4th official week of action, and came at a point which really defined the Gilet Jaunes as a national protest movement to be taken very seriously. I don’t wish to offer any further political commentary on the movement. I’d rather just document what I saw, heard and felt over the course of that day. The city had an eerie calmness about it as I arrived in the city centre. All main roads had been closed to traffic and many citizens would watch the day unfold from behind closed doors. Shops were shut or boarded up and the Christmas markets remained closed. Even the metro stop I wanted to take had been shut. Our first recording takes place as people gathered in small clusters around the normally busy Arnaud Bernad roundabout. A sense of apprehension, hesitation and uncertainty loomed. 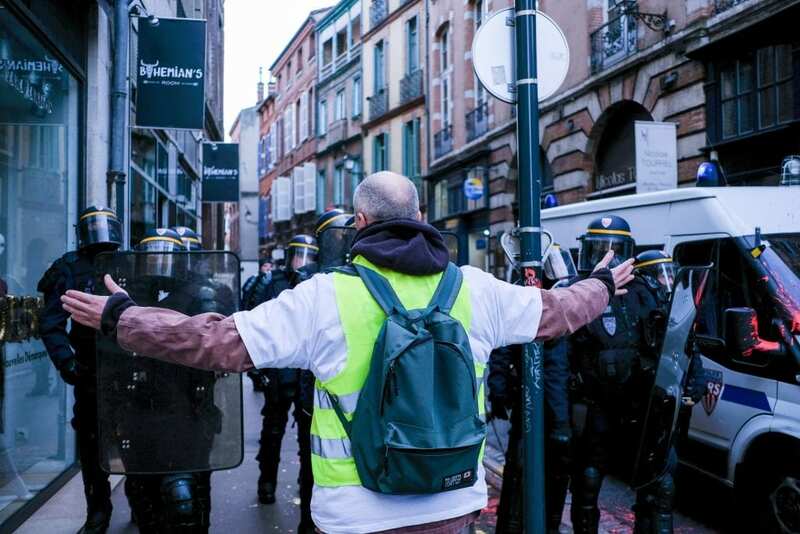 There were cries of “On y va!” “Allez!” “Vennez les Gilet Jaunes.” It was the leaders of the environmental group of Gilet Jaunes, who had officially requested to march on the day, who wanted to take off on their planned route. Many activist groups had piggybacked the protest to push their own agendas. Other smaller marches took place simultaneously all over the city. But as the whistles called out to start the march, tensions had already began to flare up just 1km down the road in the opposite direction. Clouds of tear gas and distant sirens wafted our way. Despite efforts to rally the troops to start marching, no-one moved and many looked back pensively with concern. The chilly air tinted with the smell of pepper spray had a real sense of forbidding attached to it. I left the group and started walking down the empty boulevard, towards the tear gas and the sound of sirens. As I got closer the crowds grew and the demographic changed. More young people, in their 20s and 30s were present. The vibe transformed into something more anticipatory. At this point I was still a good way off from any kind of action but I could already feel the peppery gas stinging my eyes. A long row of slow moving riot vans overtook us and the general sentiment of the onlookers become clear as they whistled and booed the police whilst parting way for the vans. The protesters were hanging out, spectating, chatting and discussing the movement. Some started drinking and playing music. 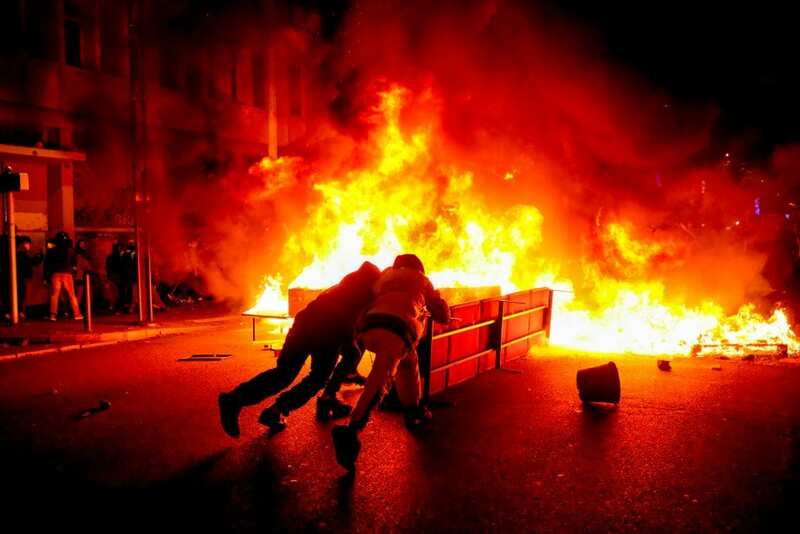 Conversations were punctuated by nearby explosions – Mostly ‘petards’ and fireworks, but also stun grenades thrown by the police. Edging slowly closer, I was little anxious over how close to get. I shouldn’t have worried, soon enough I found myself in the thick of things. I slowly advanced. The protest was taking place on a long, wide boulevard which encircles the old city centre. As the frontline of protestors came into view, so did thick plumes of acrid black smoke which rose from commercial wheelie bins that the protestors had set fire to. The popping sounds that we can hear in the recording are tear gas canisters that have been fired into the crowds. They release with a dull pop before bouncing down the road, coming to rest and oozing clouds of toxic white gas. The police then push the crowd onwards down the road, using clouds of tears gas and the odd stun grenade. 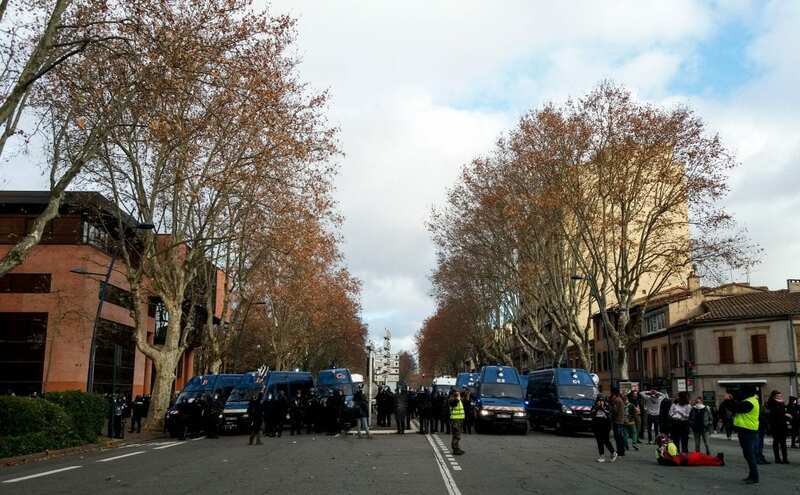 This is followed by riot squads and vans moving in on the protestors, blocking side roads and dictating a route. The protest would retreat down the roads until they are were longer pursued. They would then drag whatever they could across the road to form barriers in an attempt to stop the vans. If possible they would set fire to the barriers. The riot police then took time to overcome the blockages, form up and the process would be repeated. This became the theme of movement throughout the day. Whilst all this was happing the casseurs would start breaking, spray painting and burning. At first it was mostly bill boards, bus stops and parking meters. But as the day went on the group became more aggressive. Having finally caught up with the police front line, I had arrived slightly too late. The crowds had crossed the canal bridge on to a smaller road in a new neighbourhood of the city. Explosions sounded as a wall of gas engulfed the canal bridge, preventing protestors behind the police line from joining the main party. The scene looked like something from a first person shooter video game. Along with some first aid workers we can hear chatting in this recording, I urgently rushed to take the next bridge down, worried that police would attempt to completely block the passage. Having detoured through some back alleys I finally came face to face with the spearhead of the protests. As the recording starts we hear someone next to me exclaim “c’est la guerre!”… Its war! I emerged on to the main road to be greeted by a raging fire and a tightly packed group of young men and woman, some kitted out with gas masks, helmets, boots and military apparel. We can hear broken glass around as some nearby were busy breaking things. A group of teenage boys in tracksuits, hoods up, took turns to kick-in a bicycle station. Many had their phones out videoing. Another group faced off the police. People lent over their balconies overlooking the tightly packed avenue with concern. It really was a scene of carnage. 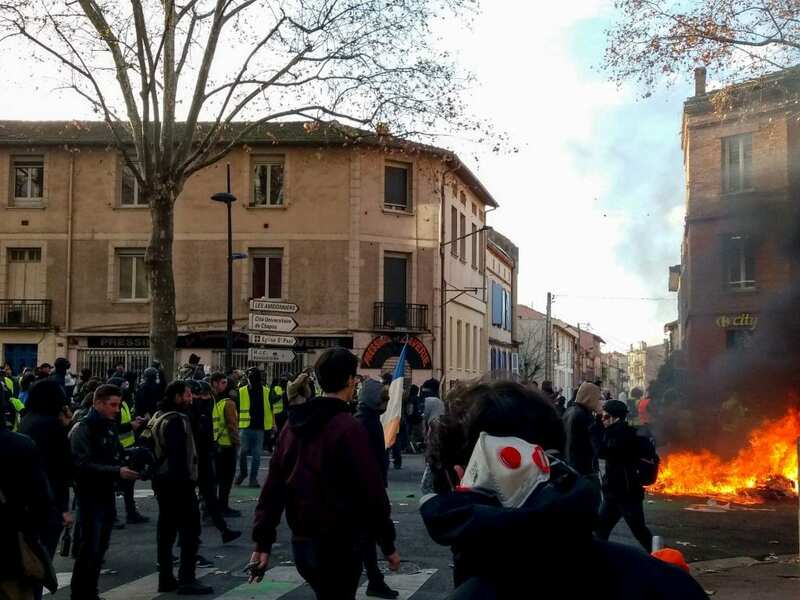 Quickly a chant breaks out of “Marcon demission” – President Macron resign! This is one of the main rallying cries of the movement. As I moved through the crowd we can just about hear the low roar of the fire, which people cluster around and add fuel to. As I moved to higher ground it was clear the group was already quite large and growing. I estimated eight to nine hundred protesters in the immediate area with many more on the outskirts. Whilst some were vandalising, many just stood around chatting. The crowd had a high-spirited “we’re all in this together” attitude. It was interesting to see that there were no protest flags or banners and very few chants. The protest had been stopped for a good 20 minutes. The next step would be to cross the river into a new area of the city. Finally we hear cries of “ils advancent!” “they’re advancing! The police were storming the barricade and a barrage of tear gas was fired at us. This quickly changed the atmosphere into one of excitement and panic. Panic rose tenfold after a huge explosion sonically rocked the bridge. Not wanting to get packed in on the bridge, I decided not to cross but rather follow a splinter group down some steps to skirt around via the next bridge along. We hear a man next to me shout “la bas, a gauche!” Down there to the left! As I looped round to rejoin the main protest from the other side it became clear that the crowd had come to a decisive halt on a very large boulevard just the other side of the bridge. Word of the location spread. More and more protesters, who had taken different paths throughout the day converged. A police helicopter circled overhead, prompting boos and gestures from the crowd. 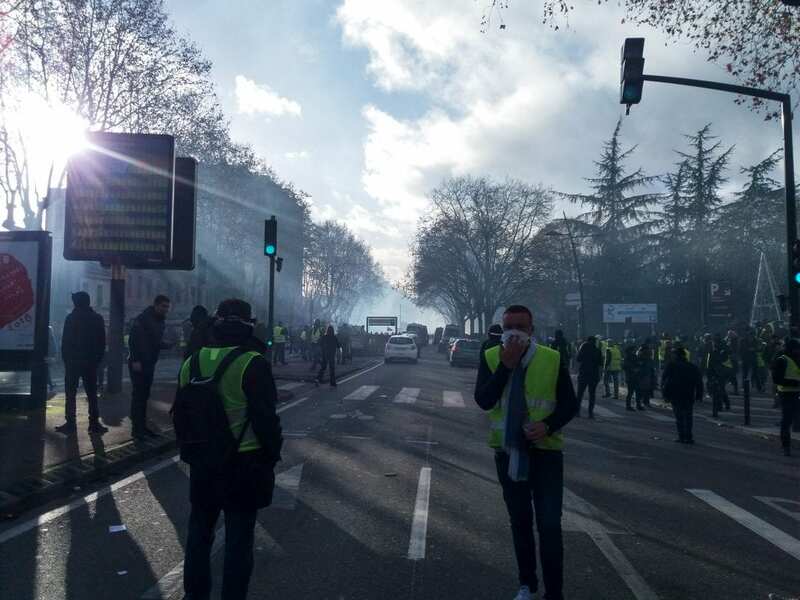 At the far end of the road the casseurs had set to work creating an enormous barricade from building site materials, which blocked all 4 lanes of the boulevard. They then proceeded to set it alight, creating a toxic bonfire that grew and grew. Concerned for the safety of my equipment I, along with many more passive protesters, stayed a little way back, keeping an exit route in mind at all times. Two girls tried to drag a dumpster past me towards the fire but were held back by the environmental group, who flat-out refused to let them burn it. The girls gave up marched off, a little embarrassed. A second fire had started, with the skip itself having been set alight. The skip was practically underneath a residential tower block. I felt real unease for the residents, who had been taken by surprise, as many watched from their balconies. Those who could, got in their cars to drive them to safety. An ambulance passed at speed, heading towards the fire and the crowd parted to make way for it. At 5.30pm night was falling and I decided to head towards the town centre to see what else was going on. The whole area felt lawless. There were no police in sight at this point. I watched as people started smaller fires and set about smashing more parking meters and billboards. I watched as someone spray painted “voleurs” across the front of a bank (Thieves). Slogans were also painted on the floor and in place of the billboards. Some had set apart breaking up rocks into smaller pieces for throwing. Outside of the main protest I felt less secure, as the ambience was more anarchist than comradely. I walked back over the river, taking a different bridge towards the main city centre. I came across more organised, vocal groups with banners and slogans, who were affiliated to various left-wing workers rights campaigning. It was clear that everyone was heading towards the protest I had just left, including teams of riot vans. I made an about-turn and joined in marching with one of the groups of about 50 people. In this recording we hear police cars fast approaching us from behind. We wheeled round to face them. 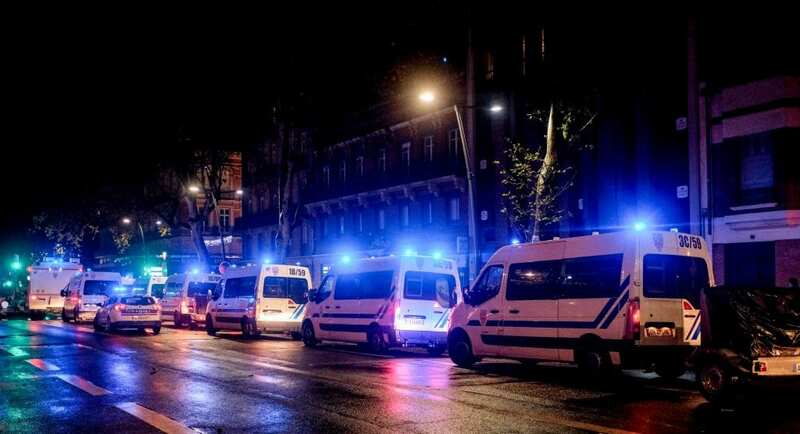 The first police cars aggressively forced their way through the protest, to the dismay of the protesters. 20 seconds later we heard more police cars approaching. Only this time the cries come out to form a chain! The protestors linked arms and we can hear a squeal as the police cars were forced to make a u-turn and find another route. A sense of power flowed the group as they cheered, some insulting the police. The chant rises up from within “Liberté.” Its one of the few times in my life that I’ve felt such a sense of group strength and power. A minute later and more police are blocked in the same manner. The chant of “demi-tour” (turn around) rings out. Other chants follow: “Macron, resign!” and “National strike! All together!” Finally, aimed at the bewildered bystanders who dotted the city centre roads: “Don’t watch us – join us”. The chanting protesters halted, apparently conflicted as to whether to join the ‘madness’. I continued on back to the spot I had left, with darkness having enveloped the area. Many of the people walking around me looked ready to cause trouble, hooded with face masks, rucksacks and booted. As I arrived back in the area, only 30 or 40 minutes after I had left, it was clear that a lot had changed. Tear gas burned my throat and eyes. 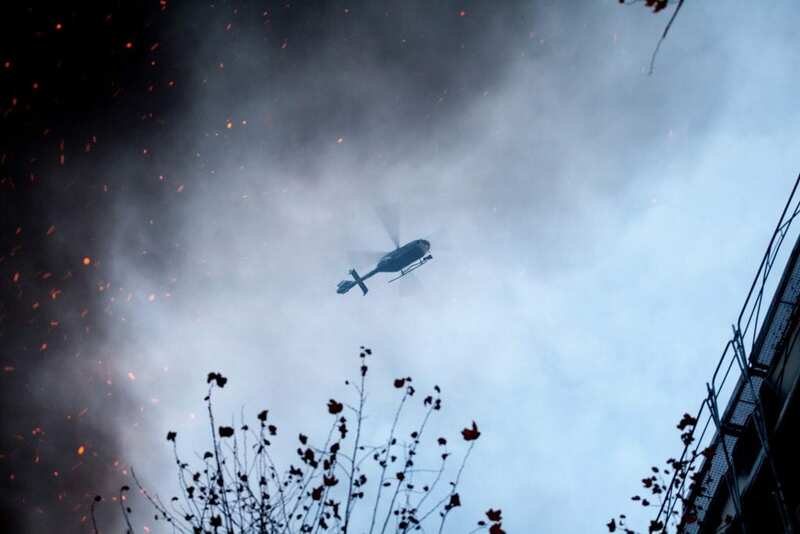 A police helicopter passed low overhead, beaming out a powerful searchlight. The lawless square that I had passed half an hour ago was almost deserted. In its place scores of riot vans with lines of police now blocked the adjoining roads, preventing anyone from directly joining what was left of the protest, which must have been scattered and pushed away from the centre. Only pockets of casseurs remained. As I reached the St Cyprien Metro station, I passed some guys who were standing around a fire throwing rocks at police. “On balance des trucs” – lets throw stuff at them. 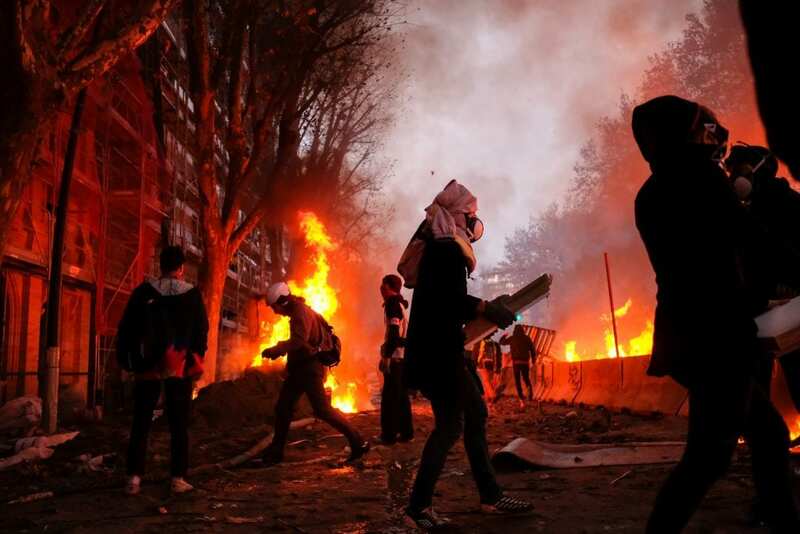 The police were responding with rubber bullets and tear gas. There was a lot of debris, and the square looked post apocalyptic. On top of this it was clear that the police had had enough and were using far more aggressive tactics. For the first time I felt there was a real danger of being confronted by the police. Unsure of where to go, I made my way back towards the 4-lane blockade bonfire which was still simmering in the distance. As I got closer it became clear that the police had taken the blockade. They were in a standoff against a final group of maybe 50 rioters, who were grouped by an adjoining road to avoid being shot at. As I joined the group they were singing and jeering at the police. They took turns to breaking apart rocks to throw, jumping from behind the wall to hurl whatever they can at the riot police. People walked around looking for ammunition, the ambience had a ‘final stand’ feel to it. I cut in and traversed alleyways and twisting cobbled streets, looking for ways back across the bridge. I was again chased and fired on by riot police as they tried to round up the remaining pockets of protestors. Exhausted I finally found an open metro station, arriving home around 7pm. The skirmishes continued into the night. Thanks for taking the time to hear this post. If you got this far – well done! As you can see, the protest had a kind of grass-roots tenacity to them with plenty of action. 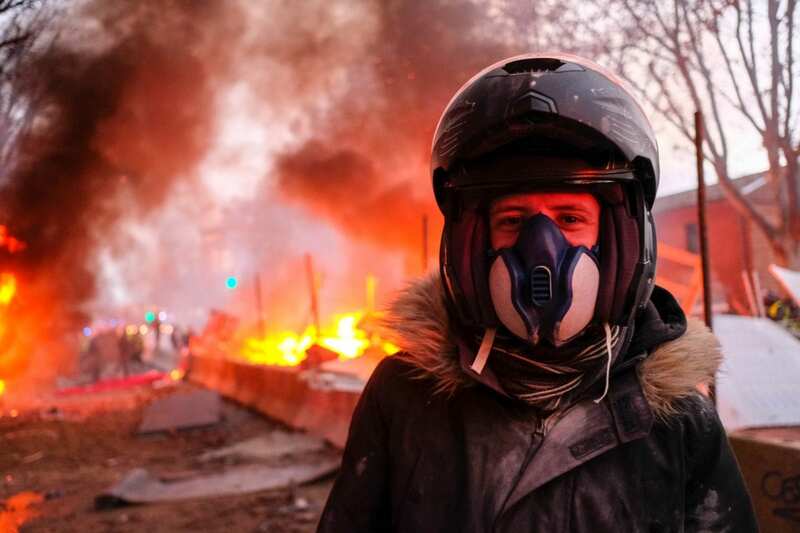 The Gilet Jaunes movement is widespread, ongoing and encompass both men and women from all walks of life who are very unhappy with their current political system and want their voices heard. There are signs of the movement spreading to other parts of Europe too. How far this will go its difficult to say, but one thing for sure is it isn’t finished yet. This is an awesome work. Thank you for being witnesses this moment. As a resident of Toulouse I was very impressed with your work. Why were you there? What equipment did you use (recorder / mics) (surely not your beautiful Lavaliers! Looking forward to more of your work. Hi Roger thanks for your comment. I lived in Toulouse for two years, learning the language and profiting from French culture, environment and cuisine! Yes I took my DPAs out and recorded at 96kHz into a SD Mixpre 6… I know i know, a risky move! I always remained perceptive and backed off whenever things started getting hot. I would like to have a cheaper rig available next time so I could stay in the thick of things. Merci à toi! This is impressive work Ben! Listening to the binaural recordings through headphones really takes you into the scene. The photos are amazing too. Thank you for documenting the events. Incredible work, thanks so much for sharing this.